State officials coast to coast appear determined to force a best-interest standard upon parts or all of financial services, particularly annuity sellers. New lawmakers were barely seated for January sessions when new best-interest ideas were put forth in Maryland and Nevada. While the situations were very different, the trend is clear. So clear that longtime industry folks are saying it’s time to cut a deal. That is, embrace a “reasonable best-interest standard,” as characterized by Gary Sanders, vice president of government relations for the National Association of Insurance and Financial Advisors. Some annuity sellers have been slow to accept that message. After all, the industry mobilized to defeat the Securities and Exchange Commission’s Rule 151 in 2010 and again toppled the Department of Labor fiduciary rule last year. But times have changed, Sanders said. Today, the SEC and the National Association of Insurance Commissioners are producing rules. And several states have rules in the works. The rest of 2019 promises to be eventful as these best-interest ideas coalesce. Officials from the SEC, NAIC and DOL and many industry leaders themselves claim to want a harmonized standard. Whether they get there is anyone’s guess. But the states are clearly driving the rush to rules. The NAIC tried to get back in front of the best-interest issue in 2018, without success. A working group could not reach consensus on key issues that divided liberal states such as New York from conservative states such as Iowa. New York led the way in disregarding the NAIC, adopting its own best-interest rule that takes effect in August for annuity sales and six months later for life insurance. It requires annuity sellers to put the customer’s best interest ahead of their own. Meanwhile, comments were due Feb. 15 on a tentative NAIC draft annuity sales model law. A group of independent marketing organizations are unhappy with the lack of forceful opposition to the rules from key industry trade associations. A letter signed by 14 IMO executives was sent to the leading trade associations that represent annuity sellers. They say trade groups are too accepting of best-interest ideas put forth by the NAIC. “We have been reading about and watching developments at the NAIC concerning ‘best interest’ and scratching our heads why our trade associations seem to be going along with the NAIC proposal and not fighting against warrantless regulations,” the letter reads. Likewise, the IMO execs did not appreciate the trade group response to the New York rule. “These concerns are exacerbated by seeing New York so easily twist best interest into a fiduciary duty with no challenge whatsoever by the life insurance industry,” the letter reads. Representatives from both the Insured Retirement Institute and the American Council of Life Insurers both pledged to work for all of their members. Both groups received the IMO letter, as did NAIFA. “We’re still working with our members on comments on the NAIC proposal but they will reflect our commitment to a uniform, harmonized best interest standard of care for annuities and securities transactions across all state and federal regulatory platforms,” said Whit Cornman, director of media relations for ACLI. 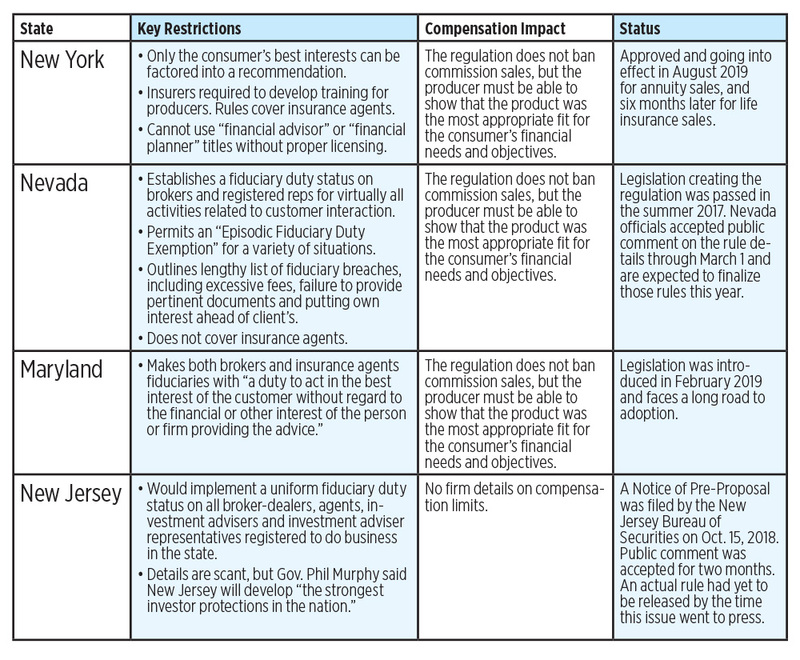 In Maryland, the Financial Consumer Protection Commission is recommending that a “fiduciary duty standard” be placed on broker-dealers and insurance agents doing business in the state. The commission cited the failure to enact financial regulations by state and federal officials as reasons to get tough on brokers and agents. “Since [the] SEC and the state insurance regulators have proposed standards that largely preserve the status quo, individual states may need to provide greater protections that investors expect from financial professionals who provide investment advice,” the report reads. State Sen. James Rosapepe introduced a bill extending the fiduciary duty standard in 2018, but parts of it were tabled after financial industry lobbyists raised concerns. Rosapepe re-introduced the Financial Consumer Protection Act of 2019 last month. The American Retirement Association was one of those groups that has concerns with the bill, said Andrew Remo, legislative affairs director for the ARA. The main concern is that new rules will fail to harmonize with the Employee Retirement Income Security Act of 1974. The pre-emption clause in ERISA ensures that the federal statute supercedes any state laws relating to employee benefit plans. If state laws conflict with ERISA standards, it will create problems for advisors attempting to comply, Remo said. So far, Maryland officials have not shown “any sort of acknowledgement of the fact that ERISA advice is already subject to a federal fiduciary standard,” Remo explained. Other states are also writing bills that conflict with the pre-emption clause, Remo said. Nevada regulators shocked the industry in early January 2019 when it released tough draft fiduciary regulations on broker-dealers and registered representatives. With some calling the latest state regs tougher than the Securities and Exchange Commission’s best-interest proposal, it isn’t all bad news for those who sell annuities in Nevada. “Commissions are seemingly preserved as a method of compensation, but the Proposal imposes ‘best interest’ and ‘reasonable compensation’ requirements,” write lawyers for Stradley-Ronon, a Philadelphia law firm. Comments were due March 1 on the rules, which fill in the details of a 2017 law passed by the legislature and signed by then-Gov. Brian Sandoval, a Republican. Critics say the Nevada rules lack details and definitions, a common complaint. Under the proposal, broker-dealers and sales representatives are subject to a fiduciary duty when providing investment advice. But there’s an Episodic Fiduciary Duty Exemption for BDs and reps that qualify. The exemption states that their fiduciary duty ends after giving the advice. But reps cannot qualify for the exemption if they hold themselves out as any of the following: “advisor,” “adviser,” “financial planner,” “financial consultant,” “retirement consultant,” “retirement planner,” “wealth manager,” “counselor” or any other title the state deems appropriate. Barbara Roper, director of investor protection at the Consumer Federation of America, is bullish in the Nevada proposal. Like the SEC rules, the Nevada proposal does not apply to insurance agents. InsuranceNewsNet Senior Editor John Hilton has covered business and other beats in more than 20 years of daily journalism. Follow him on Twitter @INNJohnH. John may be reached at john.hilton@innfeedback.com.